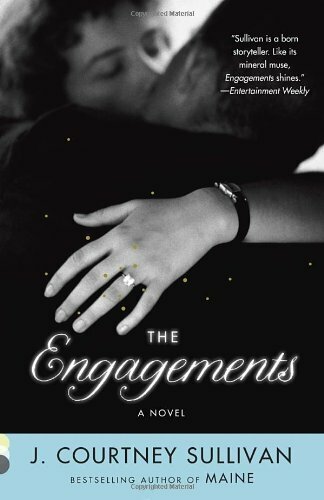 I was intrigued by J. Courtney Sullivan’s The Engagements after reading that it was awarded one of People Magazine’s top ten books of the year, so I was excited to win a copy from a Goodreads contest. After finishing the novel, I’ll say that even if I had to purchase it, it would be well worth the cost. Whether you’re recently engaged, been married for decades, or have no desire to ever head to the altar, you will enjoy this book. The Engagements is a well-researched look into the engagement ring industry and all the economic, social, and political change it incited. It appeals to people from all walks of life as it narrates the stories of five individuals throughout history, from the 1940s to today. It begins with Frances Gerety, the real-life ad woman who coined “A Diamond is Forever” in 1947 for De Beers while working for the agency N.W. Ayer. As an unmarried woman in her thirties, she was already branded as a spinster when in fact she simply enjoyed the single life. Even though her slogan became the best advertising has ever seen, it was fascinating to peer into her struggles as a woman in a man’s world. The timeline jumps forward to a retired teacher during the 1970s named Evelyn, who is distraught by her adult son’s divorce and subsequent relationship with the other woman. Then in the 1980s, we meet James, a paramedic who is consumed by guilt over failing to financially provide for his family. In 2003, a Parisian woman named Delphine leaves her husband for a much younger American violinist, only to utterly trash his apartment after catching him cheating. Finally, in 2012, Kate is a cohabitating parent who must plan for her cousin’s gay wedding even though she abhors the institution of marriage. I must warn that not all these characters are likeable; they each have their own personality flaws and instead represent a vast swath of perspectives. Readers who are more socially conservative will disapprove of Delphine’s adultery and the inclusion of a homosexual couple. Even though I can relate to Kate’s concern about blood diamonds, her character as a tightly wound Debbie Downer can be tiring, especially when spouting off her granola style of parenting. That being said, I appreciated how Sullivan approaches marriage from many angles without sugarcoating any of them. I also enjoyed diving into each story within this story, because where else can you learn about engagement rings, ambulance driving, classical music, copywriting, and post-9/11 discrimination all at once? Big thanks to Goodreads and Vintage Books for awarding me this copy. I highly recommend The Engagements and will be suggesting it to all my friends about to tie the knot!